Contributed Photo/Courtesy GCSO: Crystal McDaniel was booked into the Graham County Jail on charges of transportation of meth and heroin for sale, as well as possession of marijuana and possession of drug paraphernalia. SAFFORD – An apparent low-level drug dealer was apprehended by Safford Police early Sunday morning after being caught with various packages of methamphetamine, heroin and marijuana during a traffic stop. Crystal McDaniel, 30, of Lordsburg, N.M., was arrested and booked into the Graham County Jail on charges of transportation of a dangerous drug for sale, transportation of a narcotic drug for sale, possession of marijuana and possession of drug paraphernalia. According to a Safford Police report, McDaniel was eastbound on U.S. Highway 70 at about 1:09 a.m. in a red, Nissan sedan that came back as having its registration suspended. The officer initiated a traffic stop and located McDaniel behind the wheel with a front-seat passenger, identified as Steven Romero, and a rear-seat passenger, identified as Elfigo Graham. McDaniel allegedly told the officer that she had traveled with her cousin and his friend from Lordsburg to go to Walmart and they were on their way back home. She said she had just recently purchased the vehicle, and that was the reason for the registration snafu. During questioning, McDaniel allegedly admitted to having a couple bags of marijuana in the car’s center console. At that time, deputies with the Graham County Sheriff’s Office arrived on scene and detained Romero and Graham. A 4.5-gram bag of marijuana was eventually located in Romero’s sock, and a 1.5-gram bag of meth was located in Graham’s wallet, along with a meth pipe in a black backpack that was in the backseat. In the center console, officers located two separate bags of marijuana, weighing 4.5 grams and 5 grams, as well as a clear plastic bag with 10 small baggies containing .10 gram of heroin each, for a total of 1 gram. Another blue bag was located in a Dewalt tool box in the rear cargo area and contained a round container with 1.5 grams of meth and 10 other bags of meth, cut up into one, 1-gram bag and 10, .30-gram bags, for a total amount of 5.5 grams of meth in the tool box. Both Romero and Graham were released at the scene, but the officer informed them that he would send his report to the Graham County Attorney’s Office for possible charges of possession of marijuana and possession of a dangerous drug against them, respectively. McDaniel admitted the heroin and remaining meth was hers and that there were incriminating text conversations on her cell phone of people asking her for drugs. 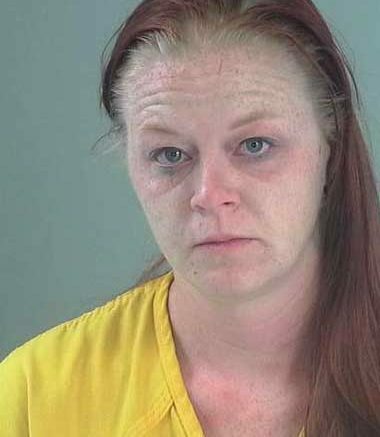 She was then booked into the jail on charges of transportation of a dangerous drug for sale (methamphetamine), transportation of a narcotic drug for sale (heroin), possession of marijuana and possession of drug paraphernalia.